The Minister of Justice, Andrew Little should be at the forefront in defending the right to life of every New Zealander from conception to natural death. Sadly he is not. Instead he is advocating not only for the killing of the defenceless unborn child as a “reproductive choice for women”, but also for the killing by doctors of the aged, the disabled and the seriously ill, through the End of Life Choice bill. He believes it’s all about ‘choice’. To deny the stigma against taking innocent human life it is necessary to deny the humanity of the unborn child. Medical science tells us that human life begins at conception. Family Planning have warned against humanising the child in the womb and always uses language in describing the developing child, to achieve that goal. It is the intention of the Labour led government to remove abortion from the Crimes Act and to make abortion a “reproductive choice for women.” The stigma is protective of women. The campaign to decriminalise abortion conducted by the government, is supported by the Family Planning Association. The authors of previous genocides sought to remove the stigma associated with the murder of the innocent; the Turkish genocide of the Armenians, the Nazi genocide of the Jews, the genocide of the Cambodians by the Kymer Rouge and the Hutu genocide of the Tutsis in Rwanda. The government disguises the genocide by euphemistically calling it ‘health care’. To say that the government’s intention is to promote abortion as health care is akin to describing the gas chambers at Auschwitz as health spas. The very foundational principle of our laws and medicine is the total prohibition on the taking of innocent human life. Abortion is the violent murder of an innocent child. Women instinctively want to protect the life of the child growing in their womb. The stigma resonnates with the conscience of women, which informs them that killing their child in the womb is always wrong. The stigma is more intense for those women who have had an abortion especially those who have been coerced by the father of the child. Men who have fathered a child often threaten to abandon the mother or use violence against her, if she objects to having an abortion. Those who seek to remove the stigma refuse to acknowledge that there are many women in our community who are suffering a lifetime of regret, grief and sorrow at the loss of their child in an abortion. Right to Life requests the Minister recognise that the killing of the unborn child is a crime against humanity and should be left in the Crimes Act. The government should promote adoption as the loving option. Why no National Memorial Service for Victims of Abortion? Why is the Prime Minister opposed to violence against Muslims yet supports violence against the defenceless unborn? The Prime Minister is commended for leading the nation in its grief and sorrow in a remembrance for the fifty innocent Muslim victims who lost their lives in the appalling massacre at the mosques in Christchurch on Friday 15 March. She will be present at a National interfaith Memorial Service for victims, which, will be held on Friday 29 March in Hagley Park at 10 am. Right to Life asks when is the Prime Minister going to call for a national Memorial Service to enable our community to express its grief and sorrow for the killing of over 500,000 unborn children killed since 1978 and the 13,000 unborn children killed each year and its compassion for the mothers who are grievously wounded by the violence of abortion? It took the Prime Minister six days to ban the sale of military style semi-automatic weapons and all assault rifles, How long will it take her to ban the instruments of abortion? We also ask when the Prime Minister and the New Zealand government, in recognition of World Down syndrome Day, is going to hold a National Memorial Service and a call to prayer, followed by 2 minutes silence for the 50 unborn children killed through the National Screening Programme in the last year? Will the Prime Minister then apologise to the Down syndrome community for promoting hate towards them and announce an immediate ban on the screening programme? Why does the government maintain a deafening silence and exhibits no remorse for the violence inflicted on our children and their mothers by the state which authorises and funds, with unlimited funding, the abortion industry as a core health service and a “reproductive choice for women”? Muslims should be free to pray in their mosques without the threat of violence and equally our unborn children should be free to live and grow in the sanctuary of their mother’s wombs free from the threat of violence. Parliamentary Bill for Bereavement Leave Following Miscarriage Should Include Abortion. Media Release 18 August 2018. Right to Life commends Ginny Andersen MP, for her Private Members Bill, Holidays [Bereavement Leave for Miscarriage] Amendment Bill that recognises the grief of mothers who have lost a child through miscarriage. This important Bill is awaiting its first reading. Right to Life encourages every MP to support the Bill at its first reading in order that it may be sent to a Select Committee, this will allow the community to make written submissions on the Bill for the consideration of the Committee. Right to Life is disappointed that the Bill does not include women who have tragically lost a child through abortion. Every child lost before birth is a tragic loss and a cause of suffering and grief for the mother. It is imperative that government, Parliament and the community, recognises the immense and lifelong loss of these mothers. Ginny Anderson claims that the loss of a child through abortion is controversial because it has been chosen by the mother. Right to Life challenges this assertion, this is a cruel deception perpetrated by advocates for abortion led by the Family Planning Association who claim that it is a women’s right to choose and that abortion is the most frequent procedure performed on women and is fourteen times safer than childbirth. They reluctantly concede that women may experience “relief, anger, regret, guilt, sadness but these feelings may come and go.” They do not admit that many women suffer a lifetime of guilt, regret and sadness at the loss of a precious child. American studies reveal that sixty per cent of women having an abortion are coerced by others, often the father of the child. There is a tremendous sadness and loneliness in the cry, a woman’s right to choose. No one wants an abortion as she wants an ice-cream cone or a Porsche. She wants an abortion as an animal, caught in a trap, wants to gnaw off its own leg. Right to Life recognises that it will be extremely difficult and politically incorrect for the government of Jacinda Ardern to support the inclusion of women who have suffered the loss of a child by abortion in this Bill. It would seriously undermine the determination of the Prime Minister and her government to change the law on abortion to make it a “reproductive choice for women” and to make the killing of the unborn child a health issue and not a crime. The last thing the government wants to do is to admit that abortion not only kills innocent and defenceless unborn children but wounds and hurts vulnerable women. The inclusion of abortion in this Bill will recognise that women are frequently coerced and subject to violence to seek an abortion and are suffering the loss of their child. A woman’s choice for the killing of her unborn child is a cry for help. On this day that we celebrate motherhood let us remember those mothers who have tragically lost a child through abortion or miscarriage. For many, Mother’s day can be a day of great sadness. Mothers never ever forget their child lost in abortion and often experience a lifetime of regret, grief and sorrow. We should acknowledge their pain and share their grief. We should mourn with those who weep. Since 1978 there have been more than 500,000 New Zealand children killed in the womb. There are in our community, tens of thousands of women who have been deeply wounded by the loss of their child in abortion. Many grieve in silence, because unlike for those who lose a child stillborn, society does not recognise the right to grieve over children lost to abortion. There are few who realise their pain. Many of these women, perhaps the majority have been coerced into having an abortion, that they did not want. Many too have been abandoned by the father of their child. Those who promote abortion, like Family Planning, tell women that they are imagining grief and that there are no adverse psychological consequences. In celebrating ANZAC Day we mourn those who have given their lives in war in order that we may be free. There were more than 18,000 New Zealanders who lost their lives in World War 1 and 11,625 New Zealanders killed in World War II, a total of more than 29,000. We must never forget the sacrifice that they made in order that future generations may live in freedom and enjoy our inalienable right to life. Throughout our nation there are monuments commemorating their sacrifice. It is an illusion though that we are now living in peace and in a world free from war. Today we are engaged in another bloody war, not with a foreign aggressor but in a war against a new enemy; our own children. Why do we feel threatened by our own children in the womb? They are the weakest and most defenceless members of the human family? Why then has the womb become a battleground more violent than Gallipoli? Since the passing of the Contraception Sterilisation and Abortion Act in 1977, there have been more than 500,000 children killed in the womb in New Zealand. These children were deemed to be of little worth and their presence a threat to society. They are unnamed, worthy only of being a number in our abortion statistics. No tombstone marks their last resting place and their mortal remains deemed to be medical waste to be incinerated; in the same callous manner as the disposal of the Jews after slaughter at Nazi extermination camps during the Second World War. This week our nation should be in mourning for our missing children who will never go through the school gates. They have been deprived of their lives in the ‘sanctuary’ of their mother’s womb. Nearly 10,000 5 year olds will commence their schooling this week, happy and laughing, full of the joy of life. A total of 50,000 5 year olds are expected during the four terms of 2018. Sadly around 13,170 who would have been the same age are missing. What would have been there joy and laughter replaced by a deathly silence. This represents nearly 526 empty class rooms. What a loss to our nation. They join the ranks of the 500,000 children who have been murdered in their mother’s womb since 1977. These are the children who were considered of little worth and whose lives were terminated by abortion. These are the nameless and whose only record of existence is a cold statistic in the Abortion Supervisory Committee’s annual report to Parliament of 2014. 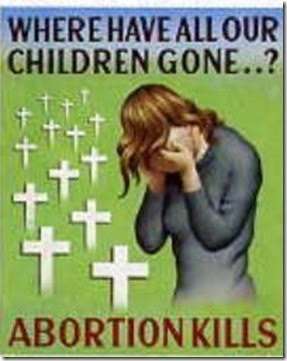 On this day as we celebrate motherhood let us remember those mothers who have tragically lost a child through abortion. For many, Mother’s day can be a day of great sadness. Mothers never ever forget their child lost in abortion and often experience a lifetime of regret, grief and sorrow. We should acknowledge their pain and share their grief. We should mourn with those that weep. Abortion is touted as a woman’s choice, but according to one study, 64% of women feel pressured into abortion by their partners. Men may pressure their partners into having abortions because they do not want a child and do not want to pay child support. A common way that men influence women to have abortions is by threatening to leave them. Sometimes a woman is so emotionally dependent on her partner that she is willing to sacrifice her baby in order to keep his “love.” Other times, the threat of physical violence or financial dependence is a factor. But, unsurprisingly, these efforts to keep the relationship intact often fail. Many times, the man will leave the woman anyway, or resentment and regret about the abortion will drive the couple apart. Several months later, the couple divorced – the emotions related to the abortion were just too much for them to deal with. “Nobody asked me, ‘Is this really what you want?’… I was hoping and praying that someone, my husband, would come in and stop it from happening. But he was totally opposed to what I wanted to do. I felt like I was just being selfish, wanting the child; it was too much of a burden on his health.” I asked how her husband’s health is now; she responds that he’s fine, but he isn’t her husband anymore. He left her a few years ago. A study done in 1985 found that 70% of relationships broke up after an abortion.